Go you! It’s sounds like that you got everything planned out pretty well 🙂 “The first draft won’t be a masterpiece. And that’s OK.” _< It's true. No first draft is going to be perfect, as much as we would want it to be. Connecting the dots in between the beginning and the end has always been the hard part for me too! Especially since it means putting through my characters through hard times! We’ll definitely cheer each other on! I sent you a DM on Twitter with my NaNoWriMo website username. The not stopping part can be hard, but I really want to plug through this! Thanks for the encouragement! You will if you keep at it. I have been considering NaNoWriMo and what I would do during it. I have no interest in starting a novel from scratch while I’m working on one now. I do plan to complete my novel during it as it is 42,000 words now and I think will wrap up around 60,000 for a good shorter novel, (recommended by most for a first novel) rather than a long 100,000 word epic. Part two of my novel will actually become book two in a two book series as it is very different from the beginning of the story. I’m going to just dedicate to using NaNoWriMo (that is annoying to type BTW with those caps) as the finishing time for my novel. First draft complete. Good luck with yours Amy! It is annoying to type out all those caps, ha ha! I think what dedicating November to finishing up what you have now makes perfect sense! Good luck with your writing as well! I love Bird By Bird! That’s a great book to read to get ready for NaNoWriMo. I’m planning on participating this year, too, although I don’t know if I have any good advice for staying focused. Having a goal really helps me. Lately I’ve been having such a hard time drafting– I think because I’m so used to revising it feels wrong to let myself just write and be okay with writing crap– so I’m hoping NaNo will help me get over it. And I just think it’s fun! I’m glad you’re doing it, too! I think having a goal will help me too, and of course having the goal to write a story in a month is definitely something to strive towards! And I agree that it is so hard to just allow yourself to write cruddy stuff! That’s totally understandable! Even if you only get a little bit written in November, like you said, it gives you something to work on in December. Normally I wouldn’t try to write so much in such a short period of time, but it felt right to try out this year. Good luck! I tried last year but I have no ideas at all this year.. so I don’t think I’ll be participating, plus being pregnant and all.. I did have fun with it last year though! Thank you! Glad to know you enjoyed doing it last year! I’m hoping I’ll enjoy it as well and not get too stressed! 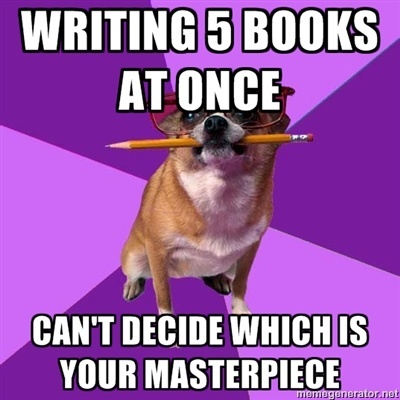 Isn’t it funny how a plot bunny can morph into a series in just a few minutes? Haha! Bird by Bird looks like a great read (and something my lackluster writing life could benefit from). I’ll definitely have to be on the lookout for it! I saw many recommendations for it so I had to check it out, and I’m glad I did! Oh! I hadn’t realized this will be your first time. Yep! “Winning” just means you reached the 50k goal! The only “writing” book I’ve read is Stephen King’s “On Writing”, but I really need to read more books on, well, writing! Haha. Thanks! I hope you do it too! I’ve been a machine this week writing up all kinds of notes on my story and the characters, hoping they’ll translate to words next month! DUDE, you’re writing FIVE books at once?! That’s insane! How do you cope? How do you manage with life? How how how? I need to learn your secret. But anyway, all the best with NaNo this year! I’m going to be participating as well, though I doubt I’ll be able to reach the word count. Doesn’t hurt to try, though, right? I think it’s extremely important to keep reminding yourself that the first draft doesn’t have to be perfect. That’s one of the only problems I face when it comes to writing: I’m constantly unsatisfied with my work, and I keep needing to fight urges to go back and rewrite. Meg, finish your first draft. Then comes the editing and revision. Need. to. get. that. into. my. thick. head! P.S. That HIMYM picture — so true. Gotta love Barney. Ha ha, that’s just a picture I found online that I felt expresses a problem I deal with, which is starting stories but being so crippled with how good it may or may not be that I freeze up. In a way, I’m writing a dozen different books, but none of them actively, out of fear that I need to find “the masterpiece.” That’s why I think I really need to do NaNoWriMo this year… To start fresh and to put the focus on one story and see it all the way through, good, bad, or otherwise. I’m hoping that by pushing through my fears I can unlock something for this story and it be a learning experience to help me work through the dozen other ideas I have, one at a time. Alright. I’ve been debating on this with myself for a few weeks now and after getting the nod of support from my wife have decided I AM going to participate in NaNoWriMo this month with a full story. I want to write a 50,000 word novel based on one of my short stories I have written. I am looking for votes as to which short story I should expand into a full novel. The Dragon of Unrest – A hero with a dragon companion suffering from his curse. I appreciate any help in assisting me with my decision. Good luck then, Anthony! Trapped in a Plane on an Iceberg is the one that sparked my interest the most. I’ve gotten a few requests for that one. Will be fun to flesh out that over confident character and the adventures he gets into, and gets out of. Good luck with yours Amy! Phew! I’ll tell you what, this is been pretty difficult, but I’m glad I’m doing it! Yea. It get’s real frustrating when those little things called work, life, and stuff keep getting in the way of writing time. Completing the 50,000 on time though will feel really good.